Opis: This month, the Mars Global Surveyor (MGS) spacecraft began its primary mission to the red planet. Orbiting about once every two hours at an altitude of over 200 miles, instruments onboard MGS now regularly explore the Martian surface and atmosphere. This MGS polar mapping orbit was set up to achieve a favorable "afternoon" sun-angle for imaging as the spacecraft crosses over the day side of the planet. 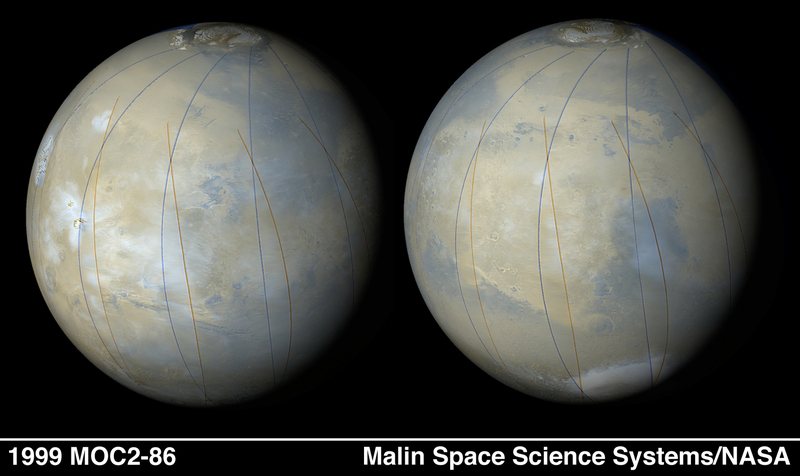 Mars' rotation will allow complete coverage of the surface roughly once every week with mapping operations planned for one Martian year (687 Earth days). 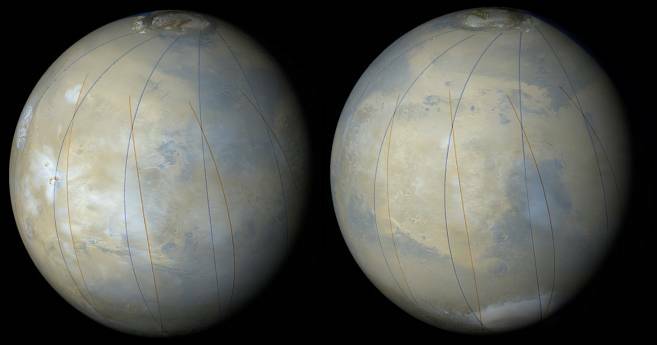 These two opposite hemisphere views of Mars were pieced together from MGS wide-angle camera scans made in early March (blue and red lines mark the scan edges). Water-ice clouds can be seen hovering over the surface while the north polar cap is visible at the top of each image.